FBL10&###x2b;AC Recessed Floor Box With 10 XLRF &###x2b;AC -PREWIRED. Recessed metal box with hinged lid for stage use 10-Female XLR jacks plus AC outlets Prewired for simple connection. Sturdy 14 Gauge Steel Construction. Hinged Lid Cover with Cable Grooves. Solid Metal Plate Insert is Mounted with Screws. Metal Plate Insert Dimensions are 8.25" x 6". Hole cutout dimension: 6.5"x8.75". 18 wires for easy plug and play connection - no soldering. Prewired and ready for easy install. Not good with a soldering iron? 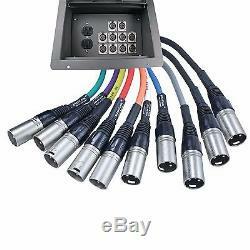 These have 18 inch color coded shielded and balanced cables wired into the box and terminated with standard XLR connectors. Simply plug in standard microphone cables to run to your patchbay, snake, digital mixer etc. In no event shall Advance MCS Electronics, Inc. Even if made aware of the possibilty of such damages. The item "Recessed Pocket Audio Stage Floor Box with10 Female XLR Mic Connectors & AC Outlet" is in sale since Tuesday, August 2, 2016. This item is in the category "Musical Instruments & Gear\Pro Audio Equipment\Cables, Snakes & Interconnects". The seller is "yovus" and is located in Goshen, Indiana.